Snapstream, the makers of BeyondTV and Snapstream Enterprise have a new Enterprise PVR that is designed more for the masses. The new product is called the Snapstream Mini and offers the powerful TV search capabilities that their main Enterprise product has for a much lower price. This is not your typical consumer HTPC but a way for an individual, business or organization to monitor and manage television media. Over the past few years, Snapstream has transformed from a consumer-based Home Theater PC software company into a two-pronged focus that offered the consumer-focused BeyondTV PVR software and the Enterprise-based Snapstream Enterprise product. The Snapstream Mini is definitely a part of the enterprise product, but a somewhat scaled-down and less expensive one. 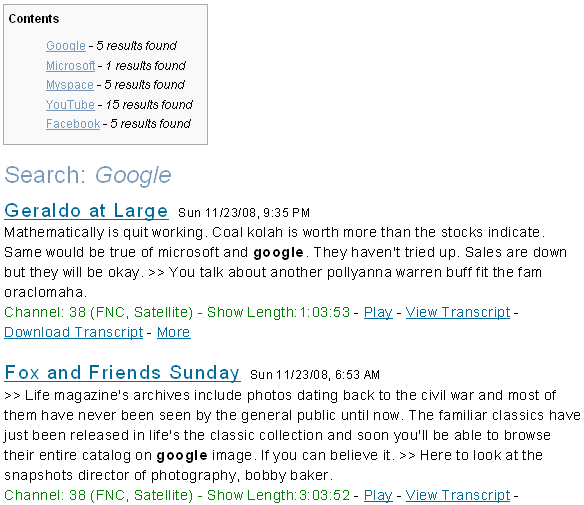 Let's say you're interested in a Computer PVR to do powerful TV search functions - searching the actual closed captions for something specific. You don't have the resources for the full-blown Snapstream Enterprise product or you don't need all of the features it includes, but you might be interested in something less expensive with the search capability still built in (Note: you can't just purchase this search capability and build it yourself - it must be purchased as part of one of the Enterprise Packages.) Well Snapstream Mini is the device for you. How is the Enterprise product used? Record traditional TV from regular cable, digital cable, or satellite (SnapStream Mini includes a learning IR blaster) into MPEG-2 format. This can be done 24-7 or you can selectively schedule recordings across selected channels with any two being recorded simultaneously. Get e-mail alerts notifying you of mentions of keywords on TV as it happens (while it's recording). How Does the Snapstream Mini Differ from other Enterprise Products? Cost is $2,000 compared to the more-expensive Enterprise product configurations starting at $8,000). SnapStream Mini can record and search over 1 terabyte of TV recordings, equal to about 1,100 hour (vs. SnapStream Servers have a default capacity of 2 terabytes space, about 2,300 hours, and can be purchased with up to 8 terabytes of usable space, about 10,000 hours. 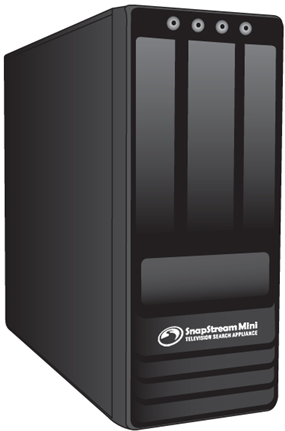 The SnapStream Mini has no redundant power supply or redundant storage arrays like its more expensive Enterprise products. Snapstream Mini is considerably quieter than the server-based Enterprise solutions because there is a little less going on inside. The tradeoff is a much more attainable price for a scaled down product that will satisfy many smaller companies, organizations or individuals needs. For a full breakdown of the difference between the Snapstream Mini and other Enterprise products check out this chart at the Snapstream website. When Will Snapstream Mini Be Available? Snapstream is taking pre-orders now and plan to begin shipping the first units on or before December 15. Ground shipping in the U.S. is included in the price of the Snapstream Mini. This obviously isn't a product for the average home theater PC (HTPC) user looking for a way to just time-shift their TV shows, but it is definitely a very cool and unique use of the PVR model in an enterprise/business use. This product and the Snapstream Enterprise product overall has great potential and I would imagine there is a wealth of potential customers out there that just need to know this sort of thing exists to save them from piles of VCR tapes or some other antiquated system to record and store media. Add to that the amazing search capability and Snapstream Enterprise should continue to find its home at more and more organizations.